bet365 is one of the most popular sites online, especially in the UK. After gauging the bet365 sign up offer (T&Cs apply), we took the opportunity to take advantage of the benefits that it brings to the table. This is our teams exclusive take on the site and we will share our experience with you on everything that was discovered starting from the registration process. 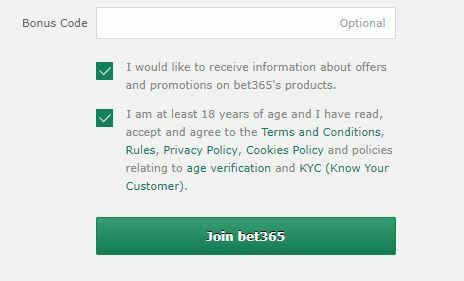 It was well worth reading the terms and conditions first before anything else as we soon realised that Neteller and Skrill weren’t eligible for the bet365 sign up offer. So we opted to buy-in using a VISA card. Arsenal welcome former title winners Leicester to north London on Monday in the Premier League and bet365 are backing Unai Emery’s side to win yet again, with odds of 4/9 (1.44) – odds are subject to change. With over 75 markets currently available for this Premier League clash, there’s plenty of opportunity to make this clash interesting at bet365. Gunners fans will be able to get a plethora of choice at bet365, especially with Europa League, FA Cup and League Cup campaigns all on-going in the 2018/19 season. One tip to our readers here is to visit bet365’s website and check out the bonuses and offers that have at the moment. As always, keep in mind to read the Terms and Conditions for each promotion and make sure that you understand the requirement before deciding the one that suits you. After activating the bet365 sports bonus code, we were happy to find that the sportsbook has on offer a vast range of markets for the biggest of sports events as well as the less popular leagues. The sports available at this betting client include football (betting on Arsenal of course), rugby, American football, ice hockey, racing, tennis, motorsports and even darts. As fans of the Gunners of course, we liked the fact that in every match there can be over 200 markets to choose from. We enjoyed the sportsbook – placing wagers on markets such as Scorecast, Half-Time/Full-Time and even Correct Score and they all came with some worthwhile odds. Maybe one of the most intriguing aspects of the bet365’s sportsbook is the live streaming feature which boasts of streaming over 140,000 events. Thanks to this cutting-edge feature, we were able to bet in-play in style and stream the matches live. In all honesty, this is something that we haven’t found at many bookies and furthermore those that offer this service don’t really have as many events to stream in real-time. To use the live streaming feature, remember that you need to have some money in your account or that you’ve placed a bet within the last 24 hours. In the hours we’ve spent placing wagers at bet365, we are completely satisfied with the services that were offered. Apart from the solid bet365 sports sign up offer, game variety, great odds and a huge market selection, the mobile betting app certainly stood out. It was an exciting to place wagers on the go and definitely an option for Arsenal fans on match days for sure.